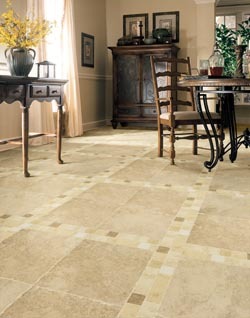 Improve the atmosphere and appearance of any room in your home with our ceramic tile flooring. Whether you’re looking to enhance your home for your family’s enjoyment or to increase your property’s real estate value, we carry a wide selection of ceramic tile products that are sure to be perfect for any project you’re carrying out. Add refinement and utility to any room with our full variety of tile in many different colors, patterns, and sizes. After choosing the perfect tile to suit your needs, budget, and style, take advantage of our ceramic tile flooring installation specialists to make sure your investment is installed and protected. Professional installation helps ensure that your new floors are watertight, long-lasting, and completely level. For households with residents who suffer from allergies, asthma, or other respiratory issues, ceramic tiles are an excellent way to prevent allergens like dust, pet dander, and pollen from getting trapped in the floor and irritating your lungs. With simple sweeping and mopping, ceramic floors can help you breathe easier and stop sneezing. Because ceramic tile floor materials are hypoallergenic, water-resistant, and available in a vast multitude of styles, they truly are suitable for any room in your house from the typical kitchens and bathrooms to the more creative bedrooms and living rooms. As more homeowners desire a lower maintenance and more affordable flooring option, this flooring becomes a much more attractive option. Bathrooms and kitchens are the most obvious choice for ceramic tile floors because they typically face a great deal of water, spills, and general moisture due to showering and cooking. In addition, if you spill sauces, wine, or cosmetics on this flooring, it is relatively easy to clean up without having to worry about stains. In addition to its resistance to water, a ceramic floor is also very durable, making it perfect for high-traffic rooms like hallways and living rooms. It is also resistant to extreme temperatures, meaning you’re able to use it outdoors without having to worry about cracking or warping in the summer or winter. Although ceramic tiles offer a lot of customization options when it comes to the layout of your tiles, it can be a bit tricky to install. That’s why it’s always best to take advantage of ceramic tile flooring installation by our team of skilled professionals. We’re able to install your new tiles in any configuration imaginable while making sure the tiles are placed evenly, properly leveled, and in a watertight manner so they’ll last as long as possible. With proper installation by our crew, your ceramic floors have the potential to last for decades with proper care and basic maintenance. Enjoy the durability and elegance of your new floors for many long years to come. With your busy life, maintaining your floors is likely the last thing on your mind. Luckily, ceramic tiles are incredibly easy to care for. All they require is regular sweeping and mopping with a basic floor detergent. They don’t require vacuuming, intensive steam cleaning, or other in-depth cleaning methods. To avoid cloudy or dull tiles, be sure to remove any sand, dirt, or other debris as soon as possible. Use a non-abrasive cloth and cleaner to wipe up any stubborn spills and periodically clean the grout with a simple baking soda and water solution. Contact us to schedule ceramic tile flooring installation with our team of skilled professionals. We’re proud to serve customers in the Irvine, Tustin, Laguna Hills, Mission Viejo, and Laguna Niguel, California, areas.